Please contact Hilary McConville at 01480 493931 or hilary.mc@btinternet.com. Training starts at 7:00 pm Tuesdays and Thursdays. Training starts at 7:00 pm Mondays, Tuesdays and Thursdays. Many groups train at the track once a week, others twice. There is a waiting list for all age groups from U11 to U15. If interested in coaching (training provided) which would allow your child to join almost immediately, please contact Wayne. Thursday is the day when new groups can be started. The most-asked question is how long someone will be on the waiting list. This depends on athletes departing the club or new groups starting. Only someone's position on the waiting list can be stated with certainty. Juniors can join Hunts AC and take part in competitions while on the waiting list. For current members, subscriptions should be paid by the end of January each year to qualify for a 10% discount. Disclaimer: Huntingdonshire AC accepts no responsibility for any injury or accident that happens to any athlete who is not a member of the club. Any athlete who trains or competes with HAC and is not a member of the club does so at their own risk. The St Ives Outdoor Centre is well sign posted and when travelling into St Ives from Huntingdon on the A1123 you should turn left at the first set of major traffic lights into Hill Rise and proceed for approximately half a mile taking the left turning into California Road opposite Thorndown School. See maps below. If travelling in from Cambridge, Ely, St Neots areas you should drive along the A1123 through St Ives following the signs for Huntingdon. At the first set of major traffic lights at the Ramsey Road junction you should proceed straight ahead. At the next set of major traffic lights you should turn right into Hill Rise then left opposite Thorndown School into California Road. See maps below. Huntingdon AC club colours are Emerald Green with an Amber Yellow Band. Club vests must be worn at all competitions when representing Hunts AC. The club carries a stock of athletics vests in various sizes. Athletics vest price is �15 (first-time membership includes the cost of a vest for single membership or two vests for family membership. Hoodies are ordered when demand is identified. A minimum of 11 is required to submit an order. Email Wayne at dubose@enterprise.net if you want to be added to the order list. Coaching and training sessions for all disciplines and age groups at the One Leisure St. Ives Outdoor Centre Athletic Track, California Road, St.Ives. The Road Runners train as a group with the more experienced runners offering encouragement to all. A training schedule is posted on the Road Runners Notice Board inside the St Ives Outdoor Centre and includes information on speed sessions, fartlek, 1k efforts, competitions and lots more. For more details on the Road Running section, press the Yellow Road Running button at the Home Page. For any Athletic Training the most important item is Footwear. Ideally you should wear well fitting, worn in Trainers suitable for the purpose. In respect of clothing any comfortable lightweight running gear, preferably light in colour if you are running on the roads (and a fluorescent vest/strip on dark evenings) will suffice. It is not advisable to wear "fashion" clothes or footwear. An athletics club was started in 1961 at St. Peter?s School, Huntingdon, under the name Huntingdon & District Amateur Athletic Club. Eighteen people attended the inaugural meeting. Alas, the club didn?t survive beyond 1962. A second attempt to revive the club in the mid-60?s also ended in failure. On October 19th 1967, the remnants of previous attempted to institute a club in Huntingdon gathered for an Annual General Meeting at St. Peter?s School. In the minutes of that meeting, the following statement appears: ?it was proposed by Mr. W.G. Stringer, seconded by Mr. W. Oldhall and resolved: That an Athletics Club be formed.? However, things did not go smoothly at the start. In 1968, Club Chairman Mr T. P. Clancy wrote in a letter to Terry Cole, who was applying for membership and later to become a leading light in the club, "It looks as if the attempt, the third, to get the club on a sound footing is a miserable failure. There appears to be a complete lack of interest in athletics in Huntingdon." By June, Terry Cole was producing a club newsletter and in it exhorting members to put in some serious hard training rather than playing about at it. In the same newsletter, it was reported that the committee had approved a suggested design for the club badge incorporating the seal of the town of Huntingdon and with the motto "He conquers who endures", the same badge which we have today. At the 1968 AGM, membership was reported at 35 and the following year, club membership had reached 80. There was no turning back now as the club was going from strength to strength. In 1969, permission was sought from the Council of the Borough of Huntingdon and Godmanchester to use this seal, which was granted. 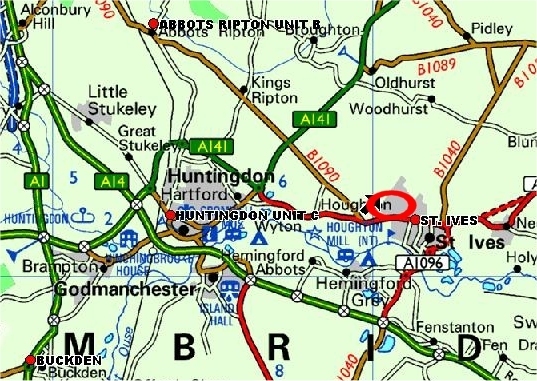 The club rules were amended in 1970 and the name was changed to Huntingdon Athletics Club. 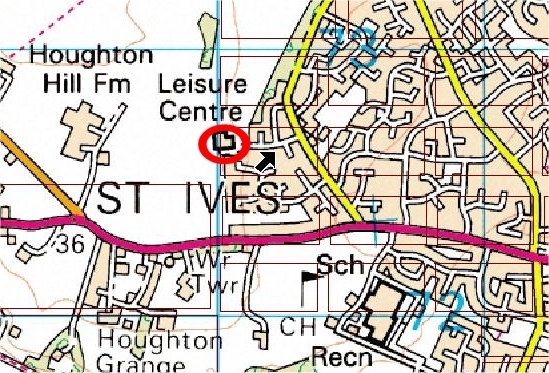 When the running track was built (cinder in the early days) at the St. Ivo Outdoor Complex, California Road, St. Ives, members began to train on this new track while at the same time keeping the original club name. A new set of club rules was adopted in 1987 and in them the club name was amended to Huntingdonshire Athletics Club, which is the official name of the club today. In 1989, the track was converted to synthetic with a Spurtan BS surface. Huntingdon & District Amateur Athletic Club held their first annual meeting last week since the Club was reformed a little more than a year ago. It was a largely deceiving first annual meeting attended by less than 20 people. There was talk about the failure of previous athletic clubs in the town; there was talk about the re-formed Club breathing, but breathing heavily; there was talk about meagre assets and there was talk about the Club still being in the process of birth. But between the apparent gloom of the past and the present there were cast some sheltered, but nevertheless optimistic rays. Club chairman Mr T.P Clancy told members of a recent blood transfusion. He was referring to Mr. Terry Cole - "Until he arrived, there was a great danger of the Club going the same way of the previous athletic clubs in the town," said Mr. Clancy. These were apt words by the chairman. When Mr Cole joined the Club in June this year there were two girl athletes who trained a couple of nights a week and a 22-year-old cross country runner. That was the extent of the Club's active membership. "I had a look at my own material and that was my family," said Mr Cole, a married man with eight children. Of his four sons, three - 15-year-old Kevin, John aged 12 and nine-year-old Philip - are now active Club members. "John Jenkins (the 22-year-old cross country runner), my boys and I trained and in August this year we entered the Thrapston Carnival Road Race. My family and I then entered, as Huntingdon AC, in the Families International Race at Brighton and in October we entered a Cambridge relay. That was our first real outing as a Club. We wore Club colours and for the first time our team did not consist entirely of Coles. "From then we have just gone on until we have now entered ten fixtures and have 35 active members, 13 of whom are seniors." Of that number a fair proportion regularly attend weekly training sessions at St Peter's on Mondays and outdoor sessions on Sundays. Members are chiefly concerned with cross country running at the moment -- there is an almost full fixture list from now until the spring -- but the work done in the gymnasium is a good foundation for summer athletics. Proof of the Club's rapid progress over recent months is likely to come in the New Year. Last week's annual meeting agreed to go ahead with plans for a Club cross country championship (to be held at St Peter's on Sunday January 19th) and an invitation cross country meeting at Gaynes Hall on Sunday February 2nd. With total assets standing at less than �12, members have to decide if the Club could afford either or both these meetings. But decisions to double subscriptions for the 17-19 year-olds and seniors (they are still almost ridiculously low at 15s and �1 respectively) and to charge entry fees for the invitation meeting should help the Club to overcome any financial burden. The Club may well be able to offer a trophy at one of the meetings. Mr Clancy said that Ald B.J. O'Neill, of Huntingdon, was willing to become Club president and also to donate a trophy. Mr Clancy (chairman) and Mr D.W. Fisher (treasurer) were re-elected at last week's annual meeting and the committee during the coming year will comprise Mr J. Milner, Mr L. Joyce, Mr H.B. Jackson, Mr Tillett, Mr J. O'Shea and Mr C. Sykes (co-opted member). Mr Cole, who became unofficial secretary soon after joining the Club, took on the office on a permanent basis as well as the match secretaryship. He has guided the Club out of possible extinction through a period of rapid development and his dedication, optimism and experience in athletics should guarantee a healthy and expanding future. Mr Cole was in the Royal Air Force for 18 years and was stationed at RAF Wyton from 1963 until he was discharged from the service in the summer of 1967 as a warrant officer master signalman. Although now 37, he is still ranked 15th in the world for the 50 miles track event - a ranking based largely on his performance in an invitation world record attempt over this distance at Walton-on-Thames in October 1966. He won the inter-services marathon in 1965 and possesses sets of gold, silver and bronze medals for RAF and inter-services marathon championships. In April, he took a RAF team to America for the Boston marathon. He was 40th out of nearly 900 starters and his RAF entry won the team event. Mr Cole, now an AAA senior coach, was also one of an RAF team of eight which ran a relay from John O'Groats to Lands End in 108 hours and 55 minutes. After last week's annual meeting Mr Cole spoke briefly of the failures of previous athletic clubs in Huntingdon and the future facing the re-formed Club. He said the collapse of the old Cromwell Club and the similar fate in 1964 of another athletic club after only four weeks had been blamed on a lack of membership, coaches and interest. "I have felt it was none of these; it was a lack of know-how. I don't think there has been a lack of interest; there has been a lack of leadership." Mr Cole took a rather cramped car to one recent cross country meeting and a problemhe does foresee in one of transport. "I am sure we can overcome this; success breeds success," said Mr Cole. On Saturday the Club, for the first time, hired a coach to take their runners to an away fixture. He can see the Club expanding a great deal by next winter and talks of an aim to win an Eastern Counties title in five years. "Soon people will be glad to be associated with the Club rather than plagued with it as they have been in the past. The Club will not die this time, that is for certain. I have got people who have made up their minds it will not die. We have got wonderful facilities at St Peter's, but we need a clubroom....somewhere to call our own and hang up our trophies." Trophies are something the Club have yet to win but, under Mr Cole's guidance, that clubroom will soon be needed.